Reliance Lyf F1 smartphone+ has been launched recently. This mid-range device has chock-full of coolest features and technology. You simply cannot miss out on this one! Reliance has taken the telecom world by a storm, these days. It has grabbed several eyeballs with its latest 4G schemes. First, it brought about a revolution with its Reliance Jio offer. Within a month of its introduction, the company recorded 16 million registrations. Reliance made a world record through this movement. Then, it launched the powerful 4G smartphone Lyf Flame 7S. This highly affordable and stylish phone became an instant hit amongst Indian masses. Now, it is here with yet another member of the Lyf series. And, this smartphone is totally awesome. Check out what this cool device has to offer! The latest addition to the Lyf series has been named, Reliance Lyf F1. It was launched on Friday, with a lot of pomp and show. It is a mid-range smartphone+, well equipped with the latest 4G technology. It comes with Reliance Jio 4G network support. To give the users an ultimate browsing experience, the device has been enhanced with Carrier Aggregation support. This technology also helps to provide better data transfer rates to customers. Furthermore, Reliance Lyf F1 is powered by a Snapdragon SoC, having 3GB RAM. It has a 5.5-inch display, along with a built-in video player. One can watch two videos at once, with the help of this video player. The videos can be viewed simultaneously on the same screen. The “Smart Play” feature embedded in it, automatically stops the video when the viewer isn’t watching. Along with this, the phone also comes with a “Smart Ring” technology. This feature helps the user locate their phone when it’s in silent mode. On the camera front, Reliance Lyf F1 dons a 16-Megapixel rear-facing camera. Additionally, the phone comes with a powerful battery, with an amazing backup system. 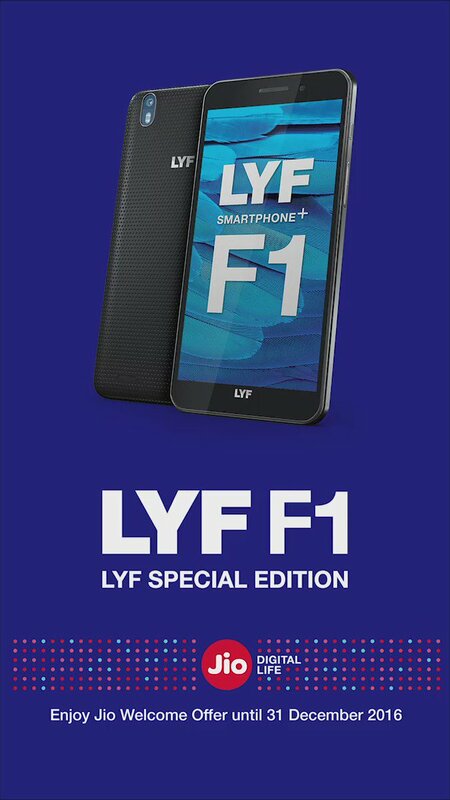 “LYF F1 smartphone+ is designed to take full advantage of the future-ready Jio network. It is unmatched in speed, quality and product experience”. Sunil Dutt believes that this device is the future of 4G technology. It is the perfect fit for today’s users, who rely on high-speed internet service, for everyday chores. You can grab the new Reliance Lyf F1 smartphone+ from your nearest retail store. It is available at an amazing price of INR 13,999. So guys, don’t waste your time thinking. Rush to the closest Reliance retail store, and get hold of this unique smartphone, now!